Long time ago i worked for Drukwerk, a Dutch comic book publishing company, where I met Ger Rijff. His main interest was Elvis Presley, which I considered a big wimp back then. But Ger took the effort to let me hear all the great stuff that Elvis had recorded, long before all these recordings became available on CD. In those days you had to find bootleg LP’s to hear something else than the most obvious Elvis recordings, and these bootlegs were already expensive and rare back then. 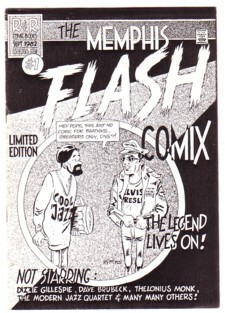 I discovered that Ger not only had a large record collection (he had more than only Elvis records) but also that he had been a very talented comic artist in his younger years. He didn’t seem interested in his own drawings at all. I literally had to beg him to find some of the stuff for me. I made a few photocopied fanzines with some of the drawings that he fished out of his closet, hoping that the response would motivate Ger to start drawing again. He never did. 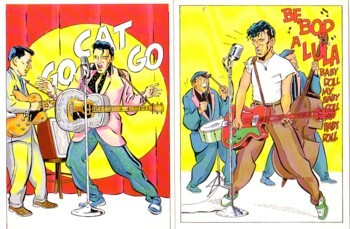 All he ever published was a set of rock’n’roll postcards. Many Elvis fans will know Ger for the many photo books with unknown Elvis pictures that he unearthed, but I still wish he had made a few of these books less and a few comics more. After Ger had turned me on into Elvis, I bought many of these bootlegs and they are still my favourite Elvis records. 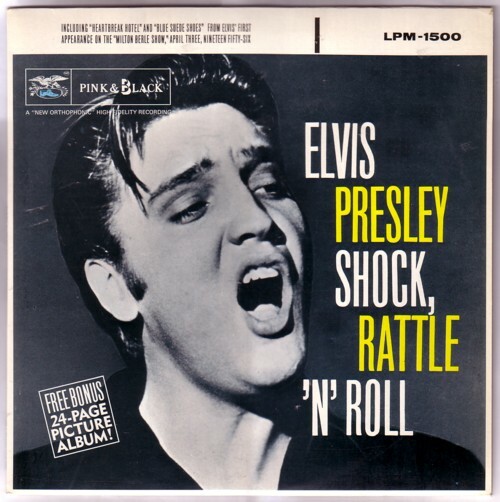 My all time favourite is Shock, Rattle’n’Roll . Not only is the Elvis on some of these recordings the most inspired Elvis I have in my collection, the LP is also an exemplary labour of love. While all the RCA LP’s in those days were nothing but easy ways to keep the money coming in, the guys who made this Shock, Rattle’n’Roll designed a stylish cover and added a beautiful booklet with pictures and articles to the album. (In my sleeve even two.) On the LP are four TV shows from 1956/57, in which Elvis performed his hits, but also a wonderful version of Peace in the valley. I like the gospel songs that Elvis did better than all his other work, and I think he did too. Even while he is singing for an audience that mainly came to scream, he manages to tap into the Main Source of True Inspiration for this song.